One of the perks of my job is the chance to visit, support and get to know our local businesses. When you get to know the people behind the doors and the kind of work they do, it’s definitely easier to feel connected to your community. Some of the businesses I visit, I wished I had pursued a career in myself. Not to say it’s never too late, but at this point in life, I’m well aware I’m not going to become a rocket scientist. Though maybe a rock star is on the horizon…. If I had to pick a top 10 job I would have opted for in life, Landscape Designer would be on that list. Which leads me to Ken Yeager, whom I met at Collage Art Gallery in Warwick, where I discovered that he was one of the proprietors of Hickory Hollow Landscapers, located on 17 in Tuxedo, NY. He invited me down to their nursery, to meet his brother Mike, who would give me a tour of the grounds and share with me their passion for this business. 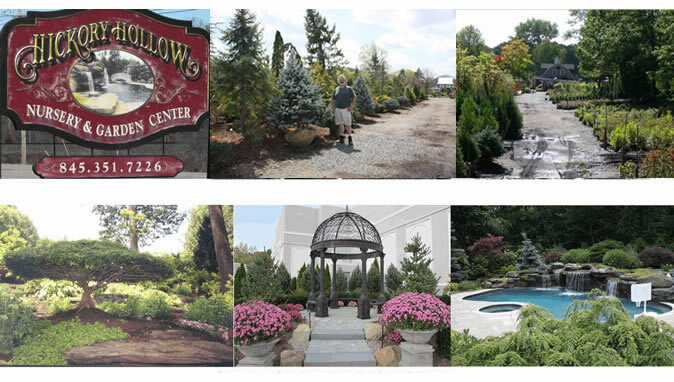 Nothing spruces up a home as well as plants and tasteful landscape design and I encourage you to drop by Hickory Hollow Landscapers to get started this spring. Yes, it’s now arrived and the blossoms are opening! Ken and Mike have spent a lifetime in the landscape business – overseeing and creating exquisite design projects (large and small), maintaining many of those projects with their crew, managing a well stocked nursery with hundreds of plants, trees, shrubs, annual and perennial flowers, and running an inviting garden center and gift-shop which includes seasonal items, a full line of pottery, fertilizers, etc. with a trained staff to help you find what you need. Even though it was mid March when I visited, Mike and I had fun walking the grounds of their 16 acre property while anticipating the eruption of spring blossoms. Later, we went inside the garden center, where Mike introduced me to Hickory Hollow’s long time manager, Keith Kissack, their garden center with array of product and their great website which showcases an impressive and well diversified portfolio of projects, with vivid pictures and videos of their work and answers to many questions you might have on growing things yourself-a great resource to have at your fingertips. 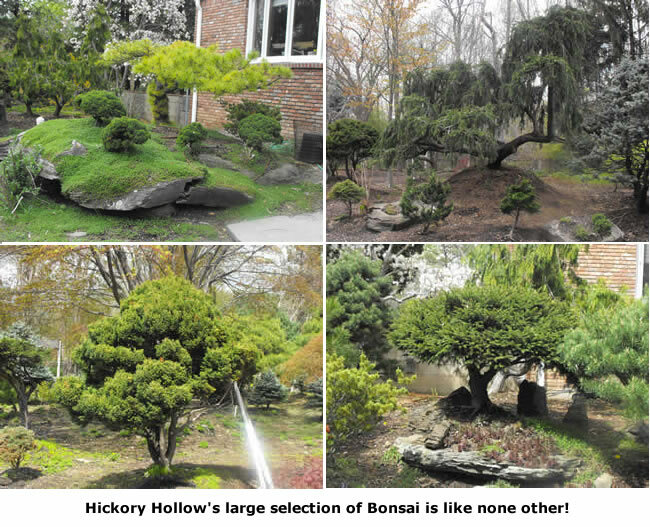 For me, the best treat of all was visiting Hickory Hollow's elite nursery in Suffern, NY, where I was introduced to hundreds of exotic bonsai plants. Seriously, you couldn't believe the artistry! Here is just a sampling. Another business destination I got a taste of, literally speaking, was La Petite Cuisine, located on Railroad Avenue in Warwick, NY. No, working in the restaurant business is not on my top 10 list of careers I’d pursue, but I have great respect for this business, having worked in it myself. And eating out is a favorite pastime I would rate way up there as activities I love to do. 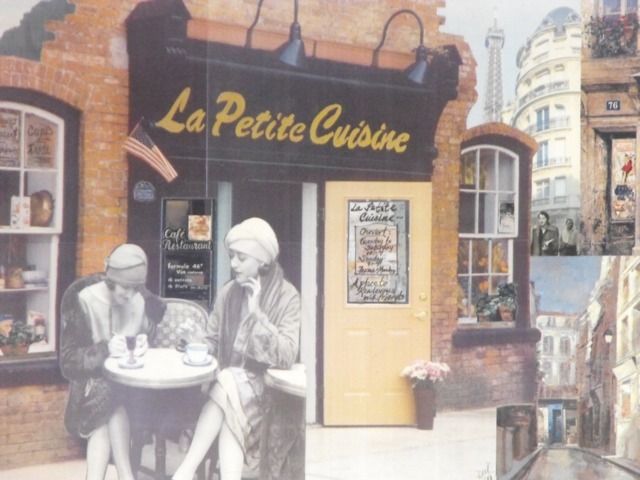 I had been to La Petite Cuisine but once. After my second visit though, I’m convinced I’ve been missing out on something very special and unique, as I’ve yet to really develop a taste for things French (I’m still waiting to see the Eiffel Tower up close and in person). Since eating at La Petite, I’m already hankering for that egg dish I recently had - what you call an Oeufs (pronounced oof) en Casserole – two eggs that were baked with Ham and Potato and topped with melted Gruyere cheese all mixed with some French Herbs from Provence with a nice arrangement of fruit. This wasn’t a typical breakfast Omelette I might have normally pursued– this was more delectable and appetizing, and included a fresh baguette. I spoke to a friend about La Petite. “Ever been there,” I said. She said, “A thousand times. They have the best onion soup, great salad with crab cakes. Yesterday I went with my sister. We had their Lentil Curry Soup. It was fabulous.” Linda Mensch, a modern dance instructor and another regular whom I ran into on my way out, indicated how consistently good their food is, a key to their repeat business. Jennifer Haesche, owner of La Petite, brings not only great food and service to the table, but her charm and exuberance for all that is Warwick. She is a dedicated member of the Warwick Merchant Guild and is looking out to make Warwick a great place to live, work and visit. There is more than just food here or fresh cheeses to take on the go. For a taste of inside Warwick outside of France, I strongly recommend this small gem of an eatery. 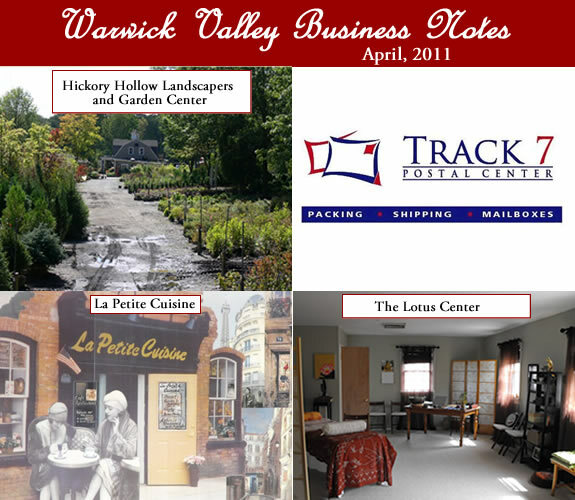 Track 7 Postal Center, located on 1st street, just around the corner from La Petite is another one of my favorite business destinations in Warwick, even when I don’t have shipping, packaging or other postal needs to fulfill. They are one of hubs of the community, accentuated by a large chair where you can sit and occupy their space – for free. The fun and banter I experience when I go to Track 7 is contagious, as we often have several laughs together before the proprietors Ken and Betsy Mitchell ask me how they can help. Our business relationship grew as I decided to sell books online and they packaged and shipped all of them, helping to keep my Amazon Book rating high while making my life much easier. Truly, they did a great job. And it was always convenient, as there is lots of parking on first street and generally no waiting lines to deal with. I’ve also used Track 7 to make copies, scans and send faxes. You can find all of their services online at www.track7.us. For a change of pace, another business I visited recently was The Lotus Center in West Milford, NJ, where I had a chance to experience a Reiki session with owner Sally Malatras who has been practicing for over 20 years. For those of you who don’t know what Reiki is, it is a Japanese form of energy healing for reducing stress, focusing the mind and restoring health. I suppose it was time for me to slow down a little bit in the course of my “busy world” and ground myself. 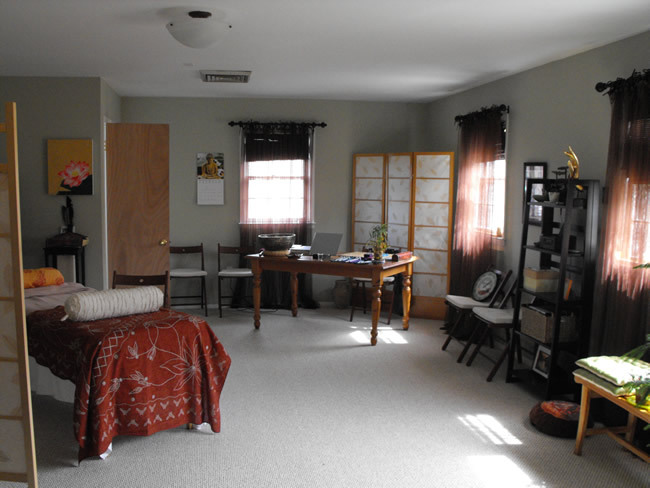 The Lotus Center is located in the same building as Harvest Moon Health Foods and I was pleasantly surprised to find the space inviting, soothing and tranquil, well maintained with a very positive energy. Sally, with her low key and self-assured nature, immediately put me at ease as she introduced me to several of the techniques she would incorporate during our Reiki session, including the use of Chumpi Stones, which are stones connected to the mountains of Peru used by Shamans for healing, and the variety of Tibetan Singing Bowls which create sound vibrations that are soothing to the body, mind and spirit. During the session I felt more relaxed. The experience was very unique as I realized I had much more work to do on myself, in terms of opening up, getting out of my head and simply relaxing into the now. 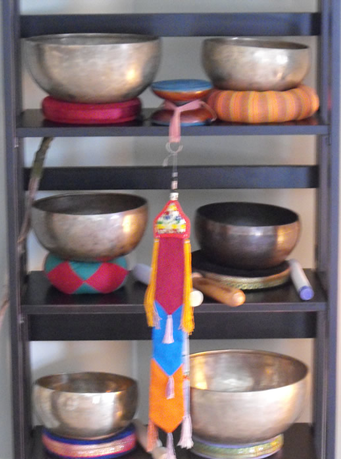 With the calming sound of music and trickling water, the inviting aroma and positive energy of the space, and Sally to guide the way with Reiki, it was a refreshing departure from a generally hectic day. For more information about the Lotus Center, you can contact Sally Malatras at The Lotus Center, 22 Marshall Hill Rd., West Milford, NJ. (973) 728-6300. Have a great April and enjoy the experience of appreciating and discovering some great local businesses.